Noibat is a Colorless Basic Pokemon, 50 HP, with a Lightning Weakness, a Fighting Resistance, and a Retreat Cost of 1. His first attack is Ram, a 1-for-10 vanilla strike, and his second attack is Destructive Sound, which does no damage and discards all the Item cards in your opponent’s hand. At first glance, this is…relatively underwhelming. The issue with Item cards is that most of the time, they’ll be out of your opponent’s hand by the time you’d use an attack like Destructive Sound. They’re meant to accelerate their own plays, after all. But there was one notable exception to the rule of sorts that invited people to try out this little bat, and that would be Garbodor. Thanks to Garbodor, people were already wary of playing down Items to load up their discard pile for an opponent’s Garbodor’s attack, but then along comes Noibat, and now they can’t even play it safe if they don’t want to lose the advantage they’d gain from playing those cards at all. In this case, Noibat presents a “lesser of two evils” – you could play out your Item cards to progress your strategy at the risk of powering up your opponent’s Garbodor faster, or you could risk holding onto them on the chance that they’ll have Noibat ready to roll and rid you of them, with the caveat being that it’s one more turn of set-up for them. It’s something that really adds more dynamic to the Garbodor strategy, as it’s no longer just a matter of either pushing hard when you’ve got advantage before they can retaliate with Garbodor or holding onto them for an auto-loss on their part; now it’s risk vs reward. And that’s usually the best kind of playstyle you can ask for. Arora Notealus: Noibat has at the least incited more challenge in a deck that, as time goes by, has been slowly fading out. Without Items getting played, Garbodor was having a tough time against the likes of similar forces, so he couldn’t be as effective. Noibat gives Garbodor decks a second chance at being able to keep up with the likes of Buzzwole-GX and Zoroark-GX, though they should remain wary of the latter’s ability to copy attacks. Side Review: Time to put a pause on this again, space things out a bit – always good to catch up on these though! Next Time: He just barely didn’t make the Top 10 list, and we’re gonna take a look at why! So with the top 10 list is over with, we are now looking at cards that have potential. Noibat is one of them due to an attack. Destructive Sound does what it says on the tin, looking at your opponent’s hand and discarding all item cards that you find there. Most decks use at least 10+ items, so you would at least get rid of one or two of them from your opponent’s hand if you’re lucky. If you really want to maximize your payoff, you would look at the Expanded card pool for me to give out examples. Vileplume’s Allergic Pollen prevents both players from using item cards. 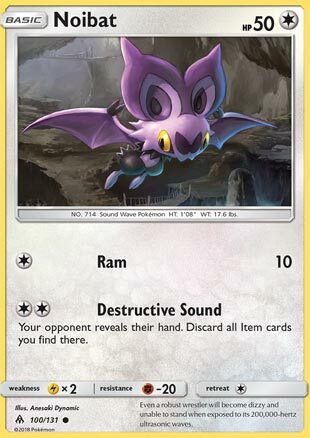 This might seem a natural fit for Noibat, as the item cards that your opponent hangs on to because they can’t use it will get tossed. This attack can be met with a single attachment of Double Colorless Energy. I won’t be going through all Noivern cards, though one that fascinates me is Noivern-GX. It’s Distort attack prevents your opponent from playing items for one turn. The tricky part will be to continuously spam Distort while keeping Noivern-GX from being KOed. Then when enough is enough, you can access its previous evolution’s attacks via Shining Celebi. I won’t recommend that because that invites more problems: being worth 2 prizes, deck space, ability denial via Alolan Muk to stop Shining Celebi, and easily OHKOed by fairies. Overall, it’s attack is good, which makes Noibat worth looking at, but if you can’t find a method to have your opponent to have their hand filled with unplayable items, then it is not worth using. Noibat (FLI 100) swoops into the meta out of the Forbidden Light expansion set. This very frail 50 HP Colorless Pokemon caught my eye because of its two Colorless attachment attack Destructive Sound. This attack forces your opponent to reveal his hand … and then discard every Item card he is holding. I know I’m not the only one who instantly saw this and thought, “Wow that might pair really well with GRI Garbodor.” And in some matches it did. One Psychic toolbox deck quit after I discarded four cards from his hand. I think I made a couple of Buzzwole players cry. And there were a couple of times when I was able to get three or even four GRI Garb lined up behind a couple of Noibats, poised to do triple digit damage for several consecutive turns. And it’s not bad – I went 13 W 13 L with a couple of different versions of the deck. In the end, however, it probably is just a novelty deck. It can wreak havoc against Psychic weak decks – and there are a lot of those running around – but there were other times when I just couldn’t pry any Items out of my opponent’s hand. It’s not terrible – you’ll win some easy games with this combo. It’s just not going to be a top tier deck. So I know on Friday I said I wasn’t going to be playing any Psychic weak Pokemon any time soon, but then Otaku went and scheduled Noibat for today. Well, GRI Garb doesn’t really count for Weakness since at 120 HP it pretty much always gets OHKO’d – there were very few times when it actually got two shot. Maybe in a more Item heavy meta this combo might fare better, but the sneak peaks I’m seeing of August’s set lead me to believe that this next expansion is going to be very ability oriented. No sign of a VS Seeker reprint yet!